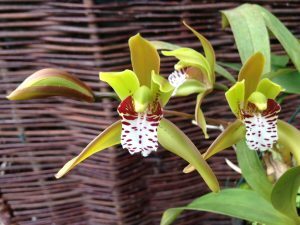 This beautiful small growing species is our eighth Cymbidium species on 365 days. It is another Himalayan species and is found growing as a lithophyte on rocks from Assam, Myanmar and China. This plant is grown from seed we sowed in 2004and is now quite a specimen. 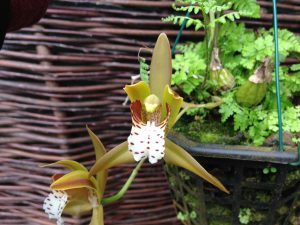 We find that plants grow really well in baskets that show their slightly pendulous large flowers off to full advantage. 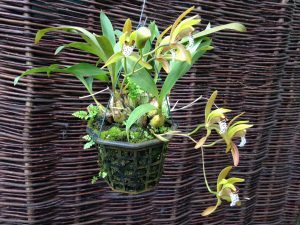 Plants look rather like Coelogynes when not in flower and we grow the species in a similar way to Coelogyne cristata with a very wet summer and a cool winter. There is quite a bit of variation in the species and we have darker and lighter clones. A less spotted but darker petalled clone.